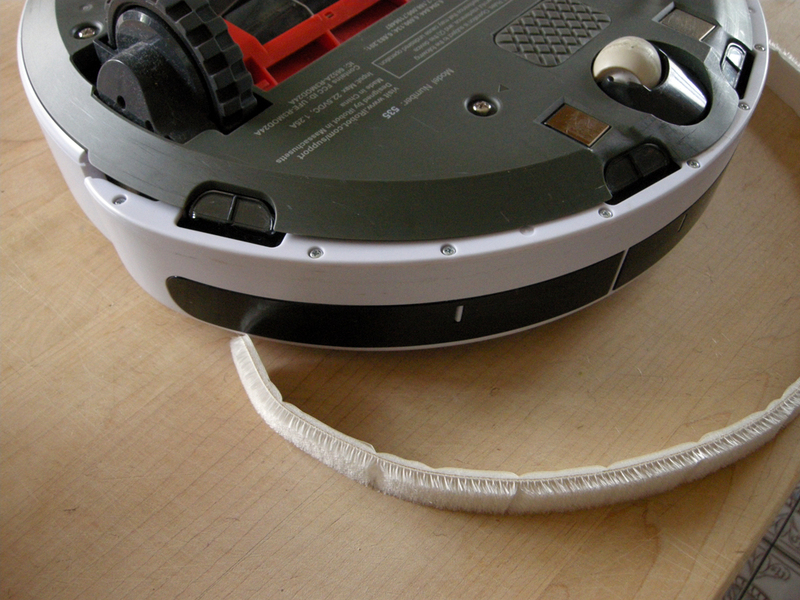 Today we’re taking a close look at the Robot AddOns Keepout Strip, an accessory for both the iRobot Roomba and Scooba lines. 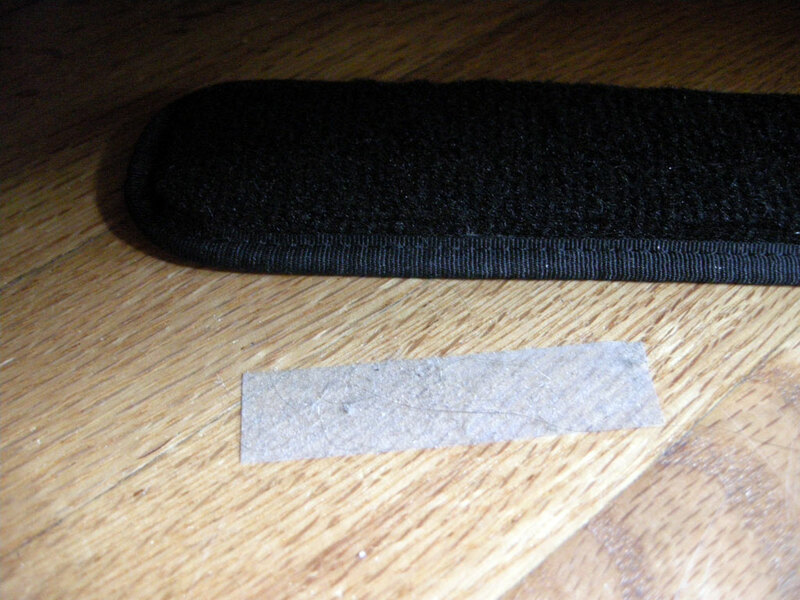 In a nutshell, the Keepout Strip is a length of black carpet with some double-sticky tape on the back. You stick it on the floor, and since it is black, your robot will refuse to cross the strip. In a perfect world, this would be handy to block off places that you don’t want your brand new Roomba 780 to go. For example, a good place to use one of these might be under your desk where all the cords and cables hide next to your computer. Another spot might be behind or next to your television. Also, if you’ve got a tricky spot in your house that your robot tends to get stuck in, that might be a place where you would install one of these. We reviewed (and really liked) the Robot AddOns Soft Bumper a while ago. The bumpers help protect the robots as well as your furniture and walls. Based on the success of this other product, we figured that the Keepout Strips would be as good. And indeed, we found that they did the job – for a while. 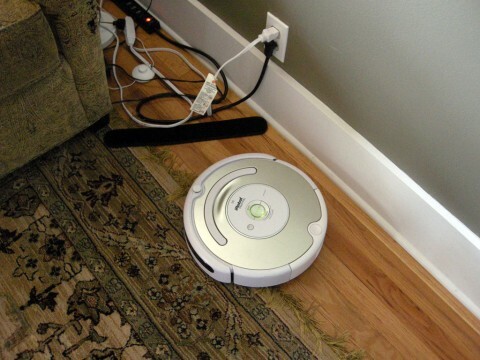 They work by fooling the cliff sensors in the Roomba into thinking that there is a step or drop-off where the strip is. 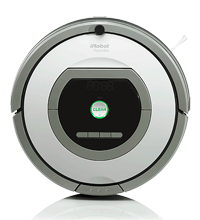 Roombas are rather famous for refusing to vacuum black or very dark carpet. The Keep Out Strips themselves look OK (although I’m totally sure that a certain percentage of the population will hate how they look). They are really as neat, clean, and inoffensive as someone can make a two inch wide, 18 inch long strip of black carpet material. Personally, I would prefer them with square corners instead of round, but something tells me that would make for bad Feng Shui. In the package, you get four strips and also some spare pieces of double-sided tape so that you can reuse the strips. It bears mentioning that these aren’t a practical solution for blocking doorways. Mostly because you’re not going to want the things sitting around in plain sight. But also because the strips have to be firmly stuck to the floor to be of any use. Indeed, it’s the double-sticky tape itself (and the necessity of using the tape) that becomes the problem with this product. Unfortunately, the bottom of the Keepout Strips is relatively slick plastic, and so the double-sticky tape has a bad habit of coming off of the strip. A person would think that this wouldn’t be a problem unless you were bumping into the strip regularly. But wait! – your robot is going to be doing just that – every time you use it. In our testing, the strips were basically useless unless they were sticking to the floor, because the Roomba (and/or the Roomba’s spinning side brush) will just knock it out of the way. The tape actually kind of stops adhering to the Keepout Strips after a couple of days, even if nothing is knocking into it. Then you’re left with gunky double-sided tape left on your nice floor, where it gathers dirt, dust, and hair until you pull it off. I thought about the possibility of using stronger tape, but the idea of putting stronger tape on the finish of my nice hardwood floors isn’t attractive. So there you have it. At first glance, these items look like a great idea. 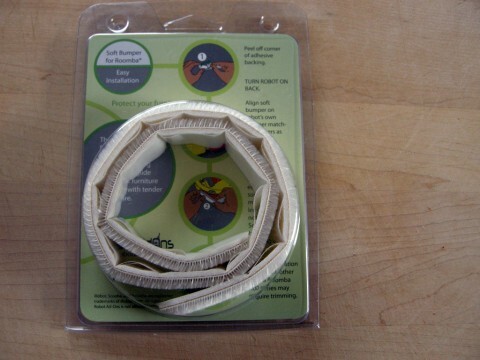 Especially in the case of spots under a desk or bed, the Keepout Strip seemed like a great way to keep your iRobot Roomba or Scooba from getting tangled up in cords (or worse yet, inhaling them and pulling them around). But in actuality, these accessories end up being a pain. In the very strange case that I haven’t talked you out of trying this product, they can be purchased from Amazon, here. . Here we’re reviewing the Robot Add-Ons Soft Bumper accessory for the Roomba. The idea is simple but ingenious. Roombas have a bad habit of plowing into table legs, and sometimes don’t see wall corners. So depending on the shape of the furniture leg or baseboard, a robot cleaner can leave some marks behind. Also, the robot will make banging noises while vacuuming, which is kind of annoying (if you’re around when your robot vacuums). 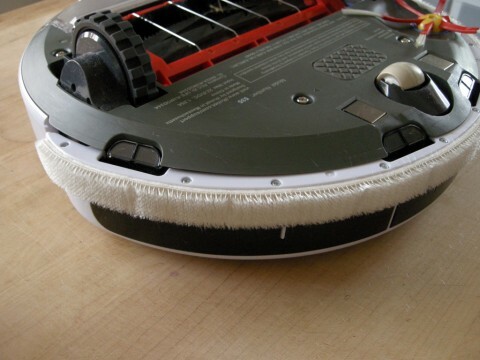 Enter Robot AddOns Ultra Soft Bumper for Roomba. 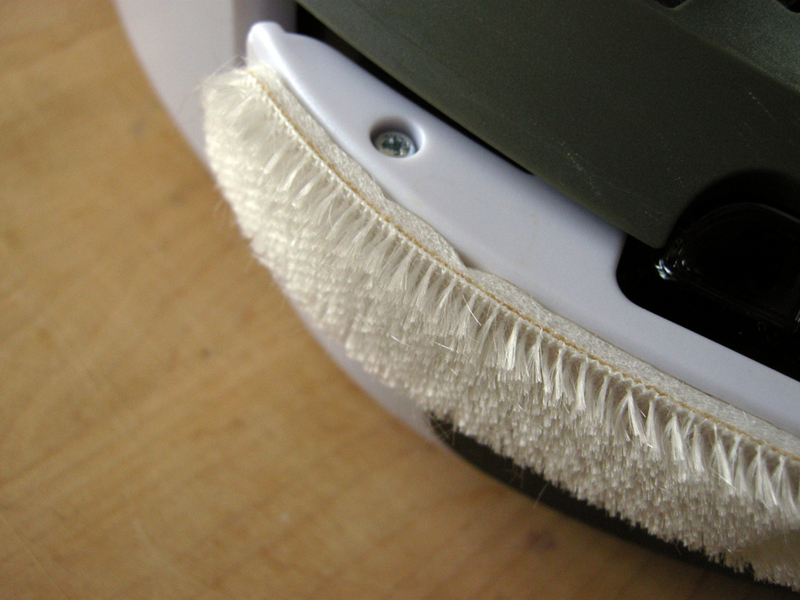 It’s designed to protect your furniture from wear and tear caused by your robot vacuum as it cleans your house. The manufacturer, Robot AddOns, is a company that was started by some engineers who had worked at iRobot. They have developed a handful of interesting inventions to improve the functionality of your robot vacuum cleaner. Mostly, these items are designed to be used with Roombas, but a few of them could probably be put to good use with some other robots. 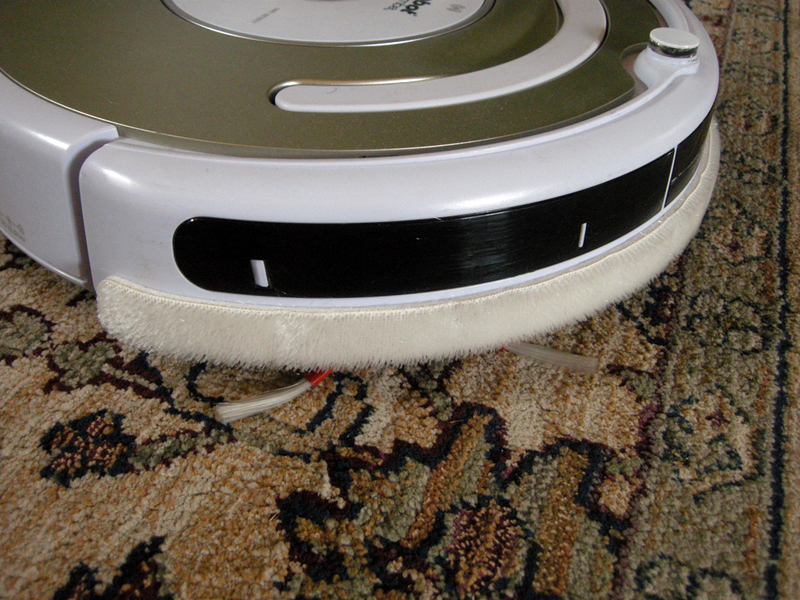 For example, this Soft Bumper would probably work well with the Neato Robotics robot vacuum. It would make a great accessory for a Roomba 780 or other 700 Series. No doubt it would also work with the iRobot Scooba, and other robotic vacuums made by LG, Karcher, and Samsung. Installation is very easy. 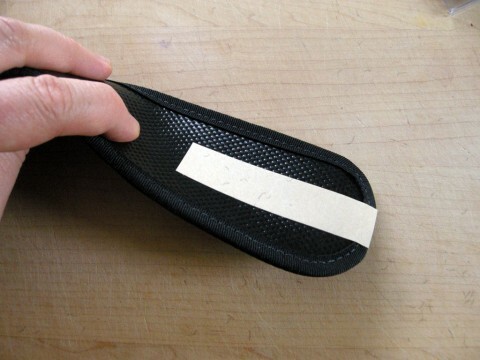 The bumper strip has adhesive on one side, so it’s as simple as applying tape to the bumper on your Roomba. Following the pictures in the instructional card that comes with the bumper, you set the Roomba on its back. Then start applying the Soft Bumper from one corner. Care needs to be taken so that you don’t cover the windows on the front of the robot. The windows have sensors behind them that detect walls and obstacles, so you don’t want to cover them. As a result, the tape should be applied with one edge along the bottom of the bumper. The instruction card also notes that the bumper tape might need to be trimmed on Roomba models other than the 500 Series. Here’s a close-up view of the Soft Bumper. As you can see, the outer layer is like a brush. It’s really soft. The inner layer is high density foam rubber. The inner layer is a little more firm. The idea is that the brush part protects from scratching the surfaces of your furniture and walls, and the foam will cushion the bumper when it hits furniture. The adhesive used on the soft bumper seemed strong enough to me that I would expect it to last for the life of the robot. This is your Roomba with a beard! Now it looks normal to me, but I have to confess that I thought it was kind of funny looking at first. I had to get used to it. So how does it work? We have a winner! Besides making your robot vacuum more gentle on your furniture, the Robot Add Ons Soft Bumper does make the robot operate in a much more quiet way. To be fair, the newer model Roombas do their best to slow down before they hit furniture and walls, but sometimes they don’t see an item. To be honest, I don’t know why iRobot doesn’t start including something like this with all the robots they sell. I’ve read some reviews where people complain that it changed the behavior of their Roomba, or that the Roomba has trouble docking with the strip installed, but I haven’t noticed anything like that. My Roomba acts and cleans just like it did before, without the banging. It’s really awesome, and would make a great gift for the Roomba fan in your house. Check these links to read reviews and/or order the products on Amazon. Besides the Ultra Soft Bumper for Roomba , there is also a new Dual Ultra Soft Bumper for Roomba. This one has a second soft strip that you put along the top of the Roomba bumper for even more protection.